I think it has happened. Whatever was in the food or the water that I fed my ladies. It has hit base. Koko, already quite an odd little (or not so little actually) creature, has now officially lost it. I am quite certain of it. 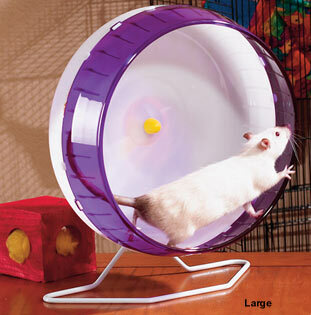 It started with this; when I first got Koko, I thought she needed exercise so I bought one of those big balls that hamsters, guinea pigs or rats can run around in. Koko was just tiny back then, but I figured, the younger she is, the better she’ll learn. I put her in, using some force, and put the ball on the floor. She was so completely freaked out by this confined space that moved and smelled unfamiliar, she started moving wildly. Now this was when she would still poop whenever she was stressed out which, in those days, was every time I took her out of the cage. So, while frantically moving around in that ball, which caused the ball to roll around swiftly, she started pooping out of stress. The ball was rolling around quite fast which caused her little droppings to be launched all around the room. Needless to say, after I managed to pick myself up of the floor from rolling around laughing (seriously tears rolling down my cheeks), and clean up the droppings, I found this wasn’t a success. Several times I tried it as she grew bigger, but not even her gutsy little sister, Ruma (being a big fan and daily user of the silent spinner), wanted to be inside that big fuchsia pink ball. So the ball disappeared among the other unused rat toys I spent a fortune on (I now make most toys myself, as they completely destroy most things anyway), under my bed (great storage place in a 1 bedroom apt..
Then, a few weeks ago, I saw someone’s cage setup and I saw they used the ball as a home/nest for their rats. Since I like to mix the cage up every now and then (or pretty much every week), I thought I’d give it a try. And whaddaya know? Koko sleeps in it. ALL THE TIME. If that wasn’t enough indication, yesterday I cried tears of laughter again. I had eaten a baguette and put the 2 ends (I hate eating those) in the cage. One was instantly found by Koko and she instantly attacked it. But, a little while later, she found the other, much bigger piece, which I had put in the bottom of the cage. I wish the camera function on my phone still worked because this would have been a video worth posting! She spent a full 10 minutes (!!!!) holding the peace in her mouth, walking around the cage in circles. Going down one floor, walking a circle, coming back up one floor, walking through one of the tubes (I thought she would hide it in there), walking back down one floor, coming back up, trying to enter the tunnel to the upper cage, doing another circle and so on and so on. She just wouldn’t drop the peace of bread or stop circling. I am sure she lost it for a moment there. Shortcircuit in her brain or something like that. Sadly, I was so amused by the whole thing I forgot to take pictures, so for once, I I only have a stolen pic of a silent spinner to illustrate my blog, but don’t despair, I am sure she will get into other trouble again soon and I can shower and bore y’all with more pictures. Right now she and Ruma are happily chewing on a piece of old Goat’s cheese each. Best toy I ever bought for a pet!